Transporting manually harvested onions from the field. During a manual harvest the onions are pulled out of the ground, their stems are clipped, cleaned by hand and put into jute bags, weighing about 35 to 45 kg. Just to get an idea of the amount of work that is done during a manual harvest of onions. 300 hectare of high quality white onions to be harvested manually. During a manual harvest the onions are pulled out of the ground, their stems are clipped, cleaned by hand and put into jute bags, weighing about 35 to 45 kg, sometimes even more. The Mexican law requires: shade and toilets for the people in the field. 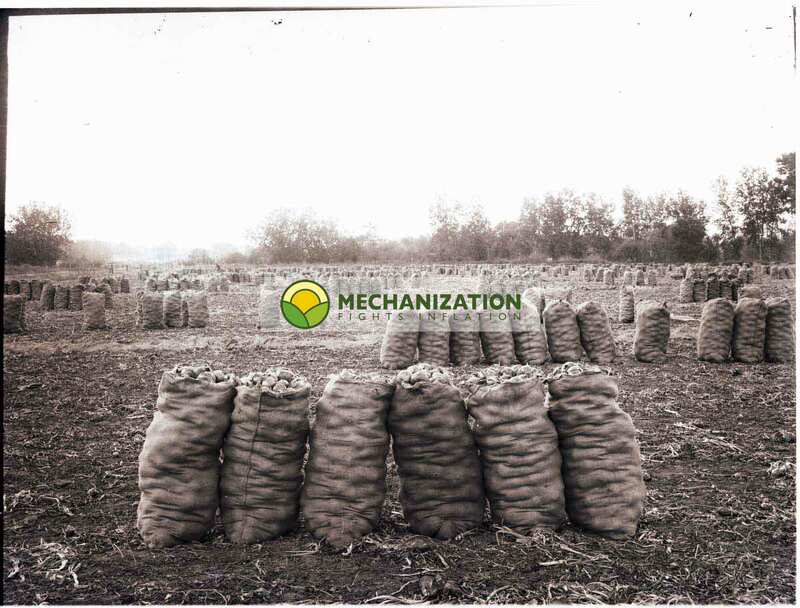 The jute bags are placed in long rows in the field, from where they are transported by enormous trucks to be taken to a temporary warehouse. 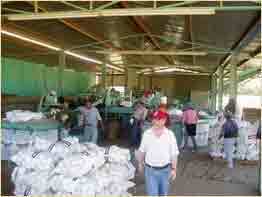 Those jute bags fulfill a very important role in the harvesting process in Mexico. Have a look at: Mexico, manual harvest, and the secret of jute bags. When the trucks arrive, all those heavy jute bags are loaded onto the truck by the fieldworkers. 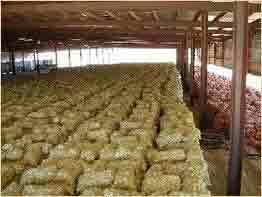 15,000 tons of bagged and stacked onions in Mexico, waiting to be graded and packed. Imagine the amount of work! All those bagged and stacked onions are carried to the grading and packing line. Once graded and bagged, they are loaded on the same big trucks to be transported to the market, often hundreds of kilometers away. Imagine the amount of work for a harvest of a field of 300 hectares with a per hectare yield of 50,000kg. This means the manual manipulation of 375,000 bags of 40 kg. 5. Carrying them inside and placing them up to 2.5 meters high on top of each other. Pressure damage during storage in bags. During all this handling of those thousands of bags with onions special care must be taken that the bags are not filled too much otherwise the onions suffer severe pressure damage as shown in the drawing. The Mexican law starts requires: shade and toilets for the people in the field.